Herbs & Spices - Hints & Tips found here and there! It's been a while since I've shared anything on this blog...my son has had quite a few health issues after knee surgery, but thankfully, he is now recovered, except for continuing physical therapy. The subject of spices came up recently during an event in which out Orchid Isle Traders Co participated. Orchid Isle Traders are Purveyors of Hawai'i island Grown Spices, Comestibles & Imports. We specialize in island grown spices, but also manufacture our own premium vanilla extract....but enough of that, this is about herbs and spices. Herbs can be grown easily in the garden or in pots on decks, or window sills. Best used when fresh, but can be used when dried. Because dried herbs are generally more potent and concentrated than fresh herbs,you'll need less -- typically three times the amount of fresh herbs as dry. For example, if a recipe calls for 1 tablespoon of fresh oregano, you need only 1 teaspoon of dried, since 3 teaspoons equal 1 tablespoon. Almost all herbs can be saved, either by drying or freezing. It's best to dry woody-stemmed and thick-leaved herbs like rosemary, thyme, or oregano (also, mint, though it doesn't fit the profile). Hang them upside-down in bunches somewhere cool and dry, then strip off the leaves and keep them in an airtight jar. Be sure they're completely dry or they will become moldy inside the jar. Soft-leaved herbs like basil and parsley are best frozen: freeze leaves, with a little water, in ice-cube trays. Thaw them out in a colander before using. If you're selecting herbs at a grocery store or farmers' market, look for ones that look fresh, are not wilted, and smell fragrant. Avoid herbs with black markings and try to taste a bite to be sure of what you're getting. If too many days have passed since you harvested or purchased your fresh herbs and they look a little droopy, revitalize them by soaking the sprigs in a bowl of ice water for a few minutes. When done, thoroughly drain the water from the bowl, wrap the herbs in paper towels, and place them in a plastic bag in the refrigerator. They should stay fresh for up to a few hours. Photo below: Bay leaves, allspice, ground cinnamon, chipped cinnamon, stick cinnamon, mace, cloves, star anise, pink peppercorn, turmeric...we normally also carry nutmeg and our own blend of mulling spices. It is not a good idea to buy spices in large quantities, unless you're a restaurant, or caterer. It is best to buy in smaller quantities...even the commercial jars might be too large if you don't use a spice often. You can judge the freshness of the spice by the color and aroma. When fresh, most spices have a bright, rich color and a strong aroma. Always purchase in small quantities to ensure that you are using fresh spices. Keep your spices tightly covered and store them in a cool, dry place. Whole spices stay fresh for up to 2 years while ground spices have up to a 6-month shelf life. Store red spices, such as paprika and red pepper, in the refrigerator. They will hold their color and keep their flavor longer. While keeping your spice jars in your "spice cabinet" located above the stove might be convenient, it is not the best place to keep them. This is because spices and herbs will begin to break down when exposed to the moisture and heat from the stove. Same problem as with the spice rack anywhere near sunlight. Pack whole or minced fresh herbs into an ice cube tray, each 3/4 full. Fill with boiling water, (this will blanch the herbs before freezing and will help them retain their flavor and color). Once the herb ice cubes are frozen, you can pop them out of their tray and into freezer bags for storage. Or you can pour extra-virgin olive oil or melted, unsalted butter over the herbs. Cover lightly with plastic wrap and freeze overnight. Remove the frozen cubes and store in freezer containers or small bags. Don't forget to label each container or bag with the type of herb (and oil) inside! Anisette is a liqueur, cordial, or apéritif made with star anise and was a popular drink in Cuba to be served during the "tea hour", at weddings, and special occasions. Most people I know served it ice cold, but it is fine to serve at room temperature. Slightly crush the star anise with a mortar and pestle, just enough to make it easier to release the natural oils. In a clean glass jar with a tight lid, combine the vodka and star anise and let stand at room temperature for about 1 to 2 weeks, shaking occasionally. Taste; when the flavor is pleasing, strain the infusion. After the 1 or 2 weeks of infusing the star anise and vodka, combine the sugar and water in a saucepan, bring to a boil, and boil for 2 or 3 minutes, skimming if necessary. Cool. Combine the anise infusion and the syrup and pour through a funnel lined with coffee-filter paper into a clean, dry bottle or jar. Cover and store at room temperature. NOTE: you can make creamy anisette by making your syrup with half water and half whipping cream. To give as gifts, decant into pretty bottles you have collected through the year. Place a star anise seed/pod inside each bottle (optional...it just looks pretty). Label, and share the recipe if you wish. Serve in small cordial or shot glasses, cold or at room temperature. I haven't made it in a long time, and have no photos of bottled or glasses of anisette, so am using public domain photo I found....except for the one on top of star anise, which I took. Star Anise is available from 'Orchid Isle Traders', a company in which I am a partner. We hosted a Christmas party a few years ago and requested our guests each bring cookies for an exchange...We had a delicious selection and everyone was pleased to notice there were no duplicates! Here is the recipe for the ones I shared. To read about the party, check the link for the original blog post at the bottom! This recipe was originally my Grandmother's Pecan Snowballs with slight changes....of course, one change was to use toasted and chopped macadamia nuts instead of pecans. Heat oven to 350 F. Coarsely chop the macadamia nuts in a food processor with the knife blade. Spread the chopped macadamia nuts on a jelly roll sheet pan and toast for about 5-8 minutes. Keep your eyes on them as macadamia nuts contain a lot of oil and might burn if left in the oven too long. Let cool. Using and electric mixer, beat the butter and 1 cup of the sugar until light and fluffy. Mix in the vanilla and salt. Add the flour, little by little, mixing until just incorporated. Mix in the toasted macnuts. Shape the dough into heaping teaspoon sized balls and shape into balls and rolling slightly between your flour coated hands; place on a parchment lined baking sheet. Refrigerate for at least 30 minutes. Cookies can be frozen at this point. To bake, bring back to room temperature and proceed as indicated below. Transfer half the balls to a second parchment lined baking sheet, spacing them about 1-1/2 inches apart. Bake until golden, about 16-22 minutes, depending on size. Bake the second batch. Let cool on the baking sheets for at least 8-10 minutes. Place 1/2 cup of the remaining sugar in a large bowl. Toss the still warm cookies in the sugar to coat all over and return to the baking sheets. Sift the remaining 1/4 cup sugar over the cookies before serving. If storing in a cookie tin or lidded plastic container, make sure they are completely cool before closing the lid. Yield: Approximately 25 to 40 snowballs depending on size of spoon or scoop used. These cookies can also make wonderful "Gifts from your Kitchen" when packed into pretty holiday tins or clear glass jars with seal-able lids or even a fun ceramic cookie jar! The original party post link: ...and a good time was had by ALL! In spite of it's French name, Crème de Vie is a popular Cuban-style eggnog which literally translated, means “cream of life.” It is a traditional after-dinner drink, usually served in sherry stem glasses and commonly enjoyed during the holidays. Often given, in decorative bottles, as gifts to friends and family members. The two holidays it is most closely associated with are Christmas and New Year’s Eve. Make a syrup by mixing the sugar and water in a saucepan and simmer for 3 minutes. You may add a stick of cinnamon if you wish. Some people like to add a bit of anisette, but I prefer without it. Add the canned milks (condensed and evaporated), the vanilla, and the rum. Stir in the sugar syrup...You can do all of this in the blender, one batch at a time. Heat the milk. Beat egg yolks. Add the heated milk to the beaten egg yolks little by little, beating steadily, so the yolks won't curdle. After all of the milk has been added, then pour the egg-milk mixture back in the milk pan and cook, at medium low for about 3-4 minutes. Cool it before adding all the other ingredients. Keep refrigerated until ready to serve. Serve in shot glasses, apéritif, or Sherry stem glasses. You can use the same recipe as above but double or triple. Whip some heavy cream with small amount of sugar until thick, OR whip the egg whites with a small amount of sugar until glossy and peaks hold up. Carefully fold whipped cream or whipped egg whites into the egg-milk mixture. Sprinkle with grated nutmeg. Serve from a glass punch or trifle bowl into glass cups. For years we have been putting together holiday gift baskets for several friends and neighbors. We collect unusual bottles, baskets and vintage linens or make large napkins with colorful tropical fabrics to line our baskets. I recently made several of the gifts from my kitchen which will be included, along with cookies and homemade holiday breads in this year's baskets. A couple of months ago I tried buying locally sourced vanilla beans in bulk, but was not successful, so ended up ordering about 100 vanilla beans from a mainland company to use in several gifts this year. Add a few vanilla beans, some whole and some split to vodka, dark rum or brandy. I prefer a dark Jamaican rum since the "sweetness" of the rum gives the extract a smoother, richer taste. Keep in a dark cool place for at least a month, shaking every once in a while. You can reuse the beans. The bottles I used this time can turn into candleholders after the vanilla is used. To re-use the beans in a new batch of vanilla, just keep in the bottle and add more vodka, rum or brandy. You might have to add a bean or two more. To save for other uses, the bean should be air dried before you store it so it will not mold. Insert one or two split vanilla beans in a jar of refined or light brown sugar. In just a couple of weeks the sugar will be perfumed with the vanilla scent and taste. You can reuse the beans. If you are using vanilla beans that have been previously used for making vanilla extract, make sure the bean(s) are thoroughly dried before you put it/them into the sugar or it/they will develop mold. The way I dry my used vanilla beans is to leave them out on the counter on kitchen or tea towels and let them air dry completely. Turn them over a couple of times to make sure all sides are dry. For every 2 pounds of sugar you pour into a plastic or glass container that seals tightly, add at least one or more (I add a few to mine, since I like a strong vanilla flavor) by sticking them into the sugar. Seal and leave for about a month. That's it! To give as gifts, put a cup of sugar into a clear glass jar or container with a sealable lid - I like to use the canning jars with clamp lids and gaskets - Insert a bean, seal and decorate jar with a ribbon or a decorative holiday theme fabric cap. Be sure to label it attractively. Can be used when baking cookies, dusting on cakes and pastries, sprinkle over your oatmeal, or even to just to add a teaspoonful in your coffee or tea.....or use your imagination! I tied 6 vanilla beans with red raffia and made little gift bundles. Place each bundle in a small zip-lock bag or wrap in clear or colorful Saran wrap. Cut passion fruit and scoop out seeds and pulp. Place in a saucepan with small amount of water and enough sugar to make a syrup - about 1 cup sugar per 1 cup liquid - bring to a boil and cook until the pulp starts loosening. Pass through a fine mesh colander or sieve. Add distilled white vinegar. Taste depends on how tart/sweet you like your vinaigrete. Bring to a boil. Cool and store in a clean bottle or jar in refrigerator. Decant into decorative gift bottles just before you assemble your basket. In one of our bulk markets, I found some plastic containers of Hawaiian sea salt with alae (red clay). I bought a large container and mixed it with a large container of red pepper flakes. I then filled smaller seasoning jars I had been saving for the purpose. I have to fezz up that I did not make the jelly myself this year. I found some delicious jellies at one of the recent craft fairs in which we participated and bought some to add to our gift baskets. I would have preferred to have used Hawaii grown vanilla beans, but could not purchase in bulk from the nearby vanilla farm in time to start preparing the gifts. last minute just to buy a gift that might or might not please the recipient. What would be better than receiving a gift made with love and care by someone you love? ...and what would be better than making them in your kitchen? I have also shared with you the ideas behind some of the gift baskets we enjoy putting together for family and friends. All through the year we look for containers that are appropriate to use as a ‘gift basket’. It can be an actual woven basket, a tray, a colander, a flower pot, or a bowl…or anything else that can hold the rest of the items you will be adding. We also like to collect unusual bottles; assorted new or vintage kitchen or table linens; even remnants of colorful tropical print fabrics, which can be easily cut with pinking shears or run-up on the sewing machine to make a simple hem. These I use as the ‘napkin-liners’ for our ‘baskets’. In the past I have also shared ideas and recipes for making your own herbed vinegar and oils, simple jams and jellies and other easy preserves. Here is one more idea that is not only simple to make, but also a lot of fun, and this is the perfect time of year to make it and have ready just in time for your holiday gift giving. Making your own coffee liqueur is fun, easy and rewarding. It is also a great project to do about a month before the Christmas holidays and give as gifts to family and friends. We like to collect pretty bottles through the year. You can find many in yard or garage sales. After a while, you will start noticing pretty bottles everywhere! Combine ground coffee and water in a bowl and mix thoroughly. just until mixture begins to steam, do not let it come to a boil. Remove saucepan from heat and let cool. Stir in the glycerin and vodka and pour into clean glass jars. Add vanilla beans making sure to include the seeds, seal and store in a cool dark place for at least 30 days before using. 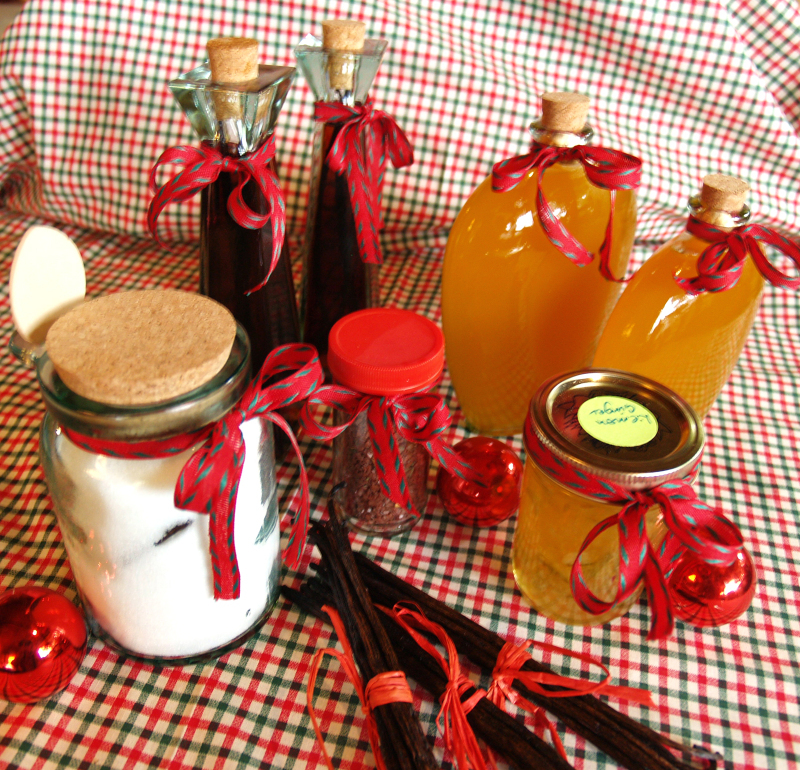 Decant into individual gift bottles, tie a pretty ribbon on the neck and tie a card with the recipe if you wish. (*) Vegetable based glycerin (95.5% USP Kosher) can be used in food applications. You can find it in most pharmacies. Excerpts from an article I wrote for the Hawaii Tribune-Herald's December 2, 2003 edition. Many years ago, I received a little cookbook as a gift that I found charming and very helpful. The title is 'The Perfect Mix', written by Diane Phillips and it was one of the first books replaced in my cookbook collection after the fire that destroyed our home and business. Since then, I have also found many recipes for mixes both in the Internet and via friends who swap them like kids would trade baseball cards. Through the years I have made several of the mixes for `gifts in a jar' and the recipients had always commented on how wonderful they were. In the last few years gift mixes have gained in popularity. They are fun to make and of course, to receive. They can be simple or they can be elaborate. Some include everything you need to make the finished product and some might need a couple of fresh ingredients, but they all remind me of the days when most gift giving was represented by something you had made yourself. It tells the recipient that they are someone special because you took the trouble to make something for them. Another clue would be hunting for just the perfect `jar' or container in which to pack your gift. It is fun to check out yard and garage sales or thrift shops all during the year to collect empty jars and baskets. My favorite jars are glass ones with the clamp-on glass or porcelain lids and we love packing gift baskets with an assortment of goodies. A gift in a jar can consist of almost anything. From mixes for soups, breads, rice medleys and all the way to deserts, they have the advantage of not being perishable, so the recipient is not `under the gun' to make use of your gift as soon as it is received. The one and only rule for making `gifts in a jar' is to make sure a recipe card is always included with the list of ingredients and the method of preparation in easy to read instructions. Consider how far and how well your gift will travel before you decide on what you will be sending. Depending on who the recipient will be, you might want to include some extra fun little touches… Cloth napkins are always appreciated; including a colorful plastic colander if sending a mix that includes pasta would be thoughtful; or even a few charming and unusual soup bowls if sending a soup mix. Let your imagination take over and your homemade gift will reflect how much fun you had putting it together. I made this mix for gifts about 5 years ago (update: now 19 years ago!) and received more compliments than for any other. Makes 40 cups for a total of 20 jars containing 2 cups each. Navy beans, Great Northern beans, dried pinto beans, red beans, dried soybeans, yellow split peas, green split peas, black-eyed peas, dried lentils, dried large limas, dried baby limas and barley pearls. Combine all ingredients in a large bowl or pan and mix well. Measure out 2 cup gift packages and store in airtight containers. Salt, pepper, chili powder, dried rosemary sprigs from the garden and a crushed chicken bouillon cube for each. See quantities in the recipe card. You can also add dried minced onion and garlic to the seasonings mix. If you send a seasoning mix, take off the list of seasoning ingredients in the recipe so the recipient will not add more. Be sure to add a little note to the card listing the ingredients in the seasoning mix. DO NOT add MSG in the form of Accént or any other form as some people experience allergic reactions. Pour the contents of the bag or jar with the Worlds' Best Bean Soup Mix into a Dutch oven, large saucepan or small stockpot. Cover with water, bring to a boil and let it boil for about 5 - 10 minutes. Skim foam, cover and let soak overnight. The next day add more water and the ham hock. Cover and bring to a boil. Reduce heat and simmer 1 1/2 hours or until beans are tender. Caution: do not add salt until the beans are tender! Salt tends to make them take longer to cook to the right consistency. Add the remaining ingredients. Simmer 30 minutes, stirring occasionally. Remove the ham hock from the soup. Take the meat from the bone, chop it and add it back to the simmering soup. Serve with homemade bread. NOTE: Since this article appeared in the news paper, I have repeated this gift once, just a few years ago for several local friends. The photos included are of this last time I gave the mix as gifts. The second time I included large, heavy white porcelain mugs. Goya Adobo Seasoning with no MSG, Dried oregano, thyme and ground black pepper, Fresh garlic cloves, Amounts are up to you and depend on how much of the bean mix you put in the bags. Instructions: Place the liquid packets of concentrated broth, the measured amounts of seasonings and the garlic cloves in Zip-lock small plastic snack bags. Add ham bone if you wish.